Having a mind much akin to a steel colander, I tend to forget about certain cars. My interest doesn't wane, really. But with all the other automotive detritus wandering through my gray spongy bits, sometimes cars fall off my mental radar screen. 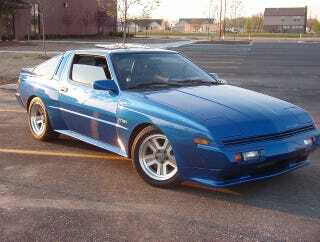 With that, I submit the Mitsubishi Starion ESI-R and Chrysler Conquest TSI twins. Before the more popular front wheel drive Diamond Star cars landed, the pentastar and three diamonds came together in a beautiful union to devise a proper sports coupe. The offspring may have looked like a Porsche 944 rip-off, but that doesn't mean it wasn't badass. Rear wheel drive, pop-up headlights, big seat bolsters, box flares, and a turbocharger. Done and done. This was brought to my attention by… well, let's call him my pen pal. Scott is a guy in Arizona stuffing a BMW M3 motor – a US M50B30 for you geeks – into an old European market 520i (E28 for the same lot). I've never met Scott, but so what? He's the kind of guy you'd want to have beers with, and that's more important. We have had epic email conversations about all sorts of silliness, ranging from unholy engine swaps to restorations to the pain of having our day jobs get in the way of our car habits. Ever have any experience with a Starion/Conquest? I used to lust after these when they came out. Something about the box flares and muscular haunches that really got me. Er, maybe that doesn't sound right. Anyway, I saw one in the junkyard a while back, quite a nice one in fact and it renewed my interest somewhat. I also saw one on [an incredibly popular blog that isn't this one featuring cars] today. I think it was from a few days ago, but it was pushing 400 horsepower. It seems I'm a closet Mitsubishi fan, given my predisposition for Gen-1 and Gen-2.5 Monteros. My first exposure was at a small car show at the Trumbull Shopping Park in Trumbull, CT, a quiet suburban enclave 50 minutes out of NYC known for the Bunny Fountain, the 1989 Little League World Champions, and meth. It was a dealer show, meaning all the cars were new stock from the local lots. Mitsubishi - likely the store in Shelton one town over - displayed a Starion TSI-R in red on black leather with a 5-speed. My previous experience with manual transmissions did not vaguely prepare me for the stick-in-firm-butter feeling of that 'box. By comparison the feel of a Datsun 610 and VW Rabbit were like stirring a box of slag with a rubber spatula. Later, my high school friend Ron - a die-hard Mustang goon - bought either a Starion or a Conquest with a blown head gasket and cracked head (this will be important later). Ron and I had sort of drifted apart after high school, and while I was aware he owned it, I neither heard much about it nor knew its fate. I don't think he ever got it running; at the same time he had a stunning silver 1984 Mustang GT and some early-70s Charger (also in pieces). I have a mental picture of the Starquest and the Charger sitting mournfully outside his garage/workshop in Oxford, CT, but that's about it. Much later, as in about 6 years ago after I moved to Minnesota, I met a guy named Boun. He had a box-flared Starquest in his garage... in pieces, the victim of a broken head. Sense a trend? After trying to track down a good engine for three goddamned years he gave up and sold it to his brother for parts. The brother also has a Starquest which may or may not run. Apparently, they ALL eat their engines at some point. Now, if you could shoehorn something like an Evolution engine in there, you'd be on to something. I still totally dig them, but you rarely see nice stock ones. There may be a reason for that. You might be able to make a stock one keeps its head on, but who knows? So that's it. Neat cars, tend to break, not a lot of nice one left. Seems to be a lot of that going around.